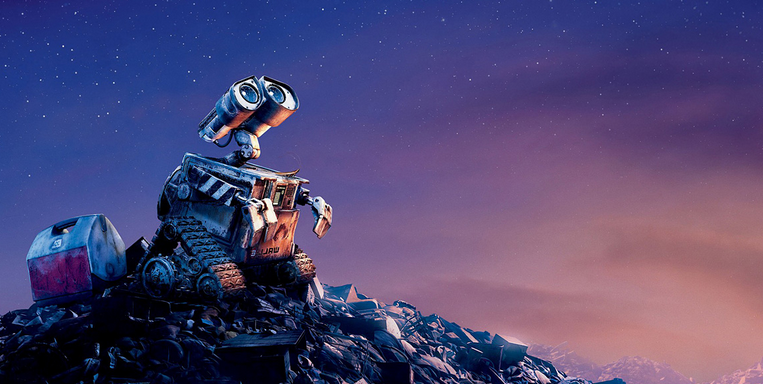 What WALL-E does that makes it unique even among its Pixar brethren is that it breathes a true sense of romance into two characters who aren’t even human, and it does so more honestly than any other animated film I can recall. [The opening montage of 2009’s Up comes close, though that film’s eventual descent into pandering action-adventure tropes tends to blunt the emotional impact of those brilliant early scenes.] What’s even more remarkable is that the film manages to do so largely without the benefit of dialogue, as the two main characters barely speak. Movements, both grandiose and minute, truly drive almost every aspect of the film, because so much of the story is told through pantomime. In discussing the creation of the film, director/writer Andrew Stanton admits that he took his cues from the earliest days of cinema; WALL-E is the sort of diffident hero who brings to mind the romantic travails of silent film comedians like Buster Keaton, Charlie Chaplin, and Harold Lloyd (the way in which the character’s eyes are shaped even evoke memories of Lloyd’s famed glasses). He’s hapless, and helpless, when it comes to EVE, but like his silent-film brethren, he’s never an object of pity or ridicule, because his quest for love is ultimately so relatable and endearing. To read the rest of this piece, please check out the full article on Wonders in the Dark! And make sure to read all of the wonderful contributions that are being posted every day as the countdown continues throughout the next two months. I liked this movie when I first saw it, but I love it more each time I see it. I agree with your comparison of WALL-E to Chaplin, Lloyd and Keaton. So true!